We run a class for our “mini-kids” - this class is aimed at kids from the age of 6 up to 10 and is a fun way to get into Taekwon-Do. The class is a mixture of theory, practice and games. The mini-kids programme is held on Wednesday nights only from 5:30pm - 6:30pm and is currently run by Mr. Jason Harding and Mr. Bob Brown, with assistance from other students in the class. During this time it is expected that a parent or caregiver be present (there is seating available inside the gym). From time to time we might even ask you to help out a little with the class. Mini-kids will be issued with their own workbook which shows exactly what is required to progress through the syllabus. This book is referenced during the class so it must be brought each night. As each mini-kid completes the sections they will be tested and be given stripes for their white belt to indicate their progress. 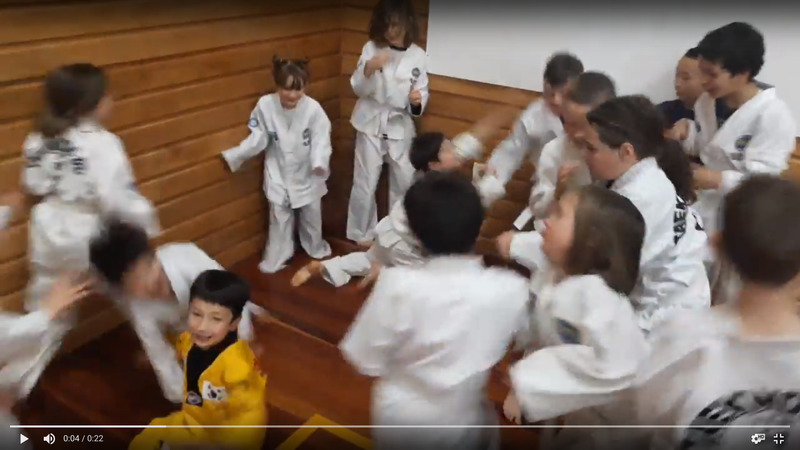 As the kids become confident and able to do so they will grade to the yellow stripes and join the main class where they can continue their training. * All stripes except yellow stripe can be given by a club instructor. The yellow stripe is the first of the national grading stripes that must be given by a nationally qualified instructor. Note: If at any time you have any concerns, questions or comments for the instructors about your child please let them know.